for $949,000 with 1 bedroom and 1 full bath. This 397 square foot condo was built in 1900 on a lot size of 0.10 Acre(s). 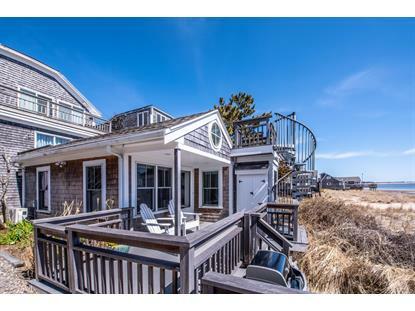 East End Waterfront... Often referred to as the Beach Rose Cottage, this magical condo is quintessential Cape Cod. Beach cottages remind us of times gone by when life was simple and carefree. The Beach Rose Cottage is no exception, but along with fond memories come all of today's modern conveniences.The cottage has been completely renovated to include kitchen with granite countertops and stainless appliances, bath with beautifully tiled floor and shower, pine floors in living room, kitchen and bedroom, and a cathedral ceiling in the living/dining area which adds to the open and bright feeling of the space. Best of all are the breathtaking views from every room in the cottage, the front porch and the rooftop deck. And, a real bonus is the convenient parking space adjacent to the cottage. All data relating to real estate for sale on this page comes from the Broker Reciprocity (BR) of the Cape Cod & Islands Multiple Listing Service, Inc. Detailed information about real estate listings held by brokerage firms other than Weichert Realtors include the name of the listing broker company. Neither the listing company nor Weichert Realtors shall be responsible for any typographical errors, misinformation, misprints and shall be held totally harmless. The Broker providing this data believes it to be correct, but advises interested parties to confirm any item before relying on it in a purchase decision. Data is updated as of 4/26/2019. All properties are subject to prior sale, changes, or withdrawal.